And how one man used Seattle’s first zoning ordinance to codify nearly 100 years of exclusion. This article is Part 1 in my two-part series about Seattle’s zoning history and its impact on the city’s housing shortage today. Though Seattle is Cascadia’s biggest city, its zoning history is a case study in the region’s larger pattern. Picture yourself, nearly one hundred years ago, on a street in Seattle’s Wallingford neighborhood, years before Harland Bartholomew’s zoning ordinances began to change the landscape. Looking around and strolling through the area, you might see an abundant mix of residential building types within steps of each other: small apartment buildings near duplexes and triplexes, boarding and lodging houses on the same block as single-family homes. You would also see a mix of Seattleites living in those homes: seniors, families, singles, couples, perhaps going about their business on the main thoroughfares, stopping at the grocer or tailor, meeting friends at a local pub or restaurant, or enjoying picnics at the new Olmsted Brothers-designed park around Green Lake. All of that is because, one hundred years ago, multi-family housing was legal to build anywhere in the city. A good thing, too: the city’s population grew from just over 80,000 in 1900 to more than 315,000 in 1920, nearly quadrupling in size in just two decades—with the housing needs to match. And places like Wallingford could offer a range of housing types to meet the diverse needs of the people and families moving to the city for its economic opportunities. Today, as Seattle undergoes another population boom, that same neighborhood is not nearly so welcoming. Fully 70 percent of land there, excluding parks and rights of way, is reserved exclusively for single-family, detached homes, and the median one is valued at just shy of $1 million. The city’s current zoning code prohibits building smaller and more affordable options like ‘plexes, townhomes, and small apartment buildings—let alone boarding houses or dorms—on nearly every block in the area, even though such options could open up opportunities for people at a greater diversity of economic means to live in that sought-after neighborhood and enjoy its amenities, too. Worse, its local “community council” actively lobbies against these kinds of home options (more on that later). Unfortunately, this is not a unique story. Though Seattle is Cascadia’s biggest city, its zoning history is a case study in the region’s larger pattern. Prior to the city’s first zoning ordinance in 1923, what you could build in Seattle was outlined in a tidy fifty-one page building code first published in June of 1909. The city was already experiencing some of the above-mentioned growth, and with memories still fresh enough of Seattle’s Great Fire just twenty years earlier, it focused almost entirely on ensuring buildings complied with basic construction and safety standards (the words “fireproof” and “approved slow-burning construction” make conspicuous appearances throughout the document). The 1909 building code defined seven building classes (A-G) based on construction and fireproofing standards. Class A buildings had the most stringent safety requirements and could also be the tallest (up to 200 feet); Class G buildings generally had the least rigorous construction and building material standards and could reach a max of only 40 feet. The code also divided the city into four building districts, concentric rings emanating from the center of the city’s downtown core. The city permitted only buildings with the highest fireproofing standards and allowable height limits (Classes A-C) in the downtown core, while districts farther from the core could also include buildings in the lower classes, those that were shorter and had fewer fireproofing and structural requirements. The smallest dwelling unit the code regulated was “a building designed and used only for the residence of not over two separate and distinct families” [my emphasis]. In other words, it didn’t even mention the concept of a single-family dwelling. Beyond that, the code defined an enviable variety of other home types, all multi-family, including the apartment house, flat building, and lodging, boarding, and tenement houses. Eight years later in 1917, the city updated the code, slightly changing the building district boundaries emanating from downtown and consolidating the seven building classes into four: fireproof, mill, ordinary masonry, and frame buildings.But generally the same city design principles outlined in the 1909 code stood: the city permitted only buildings with the tallest height limits and most extensive fireproofing requirements in the downtown core, and allowed a gradually greater mix of buildings in districts emanating from there. 1917 zoning map of Seattle. Public domain. But most interesting for today’s readers, perhaps, is that there were no restrictions on where different kinds of homes could be located. This included apartment buildings, flats, family residences or dwellings, boarding and lodging houses, dormitories, hotels, and clubs, and it’s why many of Seattle’s present-day single family zones include duplexes, triplexes, and apartment buildings. There simply was no single-family zoning, so you easily could have had a small apartment building beside a detached home. In other words, by present-day standards, none of Seattle was zoned less than Lowrise 3. That is, it could include any type of home under 40 feet in height, from a single-family house to a duplex, from a townhouse to a small apartment building. And of course, much of the city—particularly land closer to the downtown core—permitted buildings much larger than that. This was the kind of code that told the world: Seattle is ready to grow into a world-class city, and we’ll build all the kinds of homes it takes to house the workforce that will get us there. Well, that didn’t last. Just six years later in 1923, Seattle would implement its very first zoning ordinance, compliments of one Harland Bartholomew, the chief planner of St. Louis, Missouri. Bartholomew’s office worked on comprehensive plans for hundreds of cities across North America, including Vancouver, BC, and many others on the West Coast that today are dominated by exclusive single-family zoning, sprawl, and severe housing shortages. He was also an early car-head, including wide boulevards in his plans in order to privilege commuters driving into cities from their homes in the suburbs. While it sought to demarcate areas of industry, commerce, and residence, the ordinance additionally reflected the desire of the elite to maintain existing patterns of racial segregation…. Recognizing that these informal boundaries might shift or that a growing black population might spill over into heretofore white neighborhoods, the strict application of zoning laws, particularly having to do with dwelling standards, went a long way toward preserving the exclusivity of white enclaves. Seattle’s new zoning code brought with it some major changes in how the city thought about building and design. As we’ve written about before, Bartholomew’s zoning ordinance was one of sweeping downzones and initiated a slow strangulation of Seattle’s housing options, setting the city on a crash course with today’s acute housing shortage. The 1923 plan differed from the previous codes in that it shifted the focus from safety and construction requirements to regulations on building uses across town. As a part of this, it mentioned the concept of a single-family, detached home (an idea absent in the previous building codes), and introduced the first single-family zoning restrictions Seattle had ever seen—outlawing multi-family housing in about 46 percent of the city, excluding parks and rights of way. It also codified the city’s first blanket height restrictions. The previous building code had worked to discourage smaller buildings in the city’s downtown core but permitted larger buildings anywhere in the city; this zoning code brought with it the first outlawing of height across most of the city. Description of the “first residence district,” from Seattle’s 1923 Comprehensive Plan. Public domain. With the new focus on use, rather than safety, the code scrapped the previous building districts and instead divided the city into six use districts: first and second residence districts, business, commercial, manufacturing, and industrial. The first residence district allowed single-family dwellings, public and private schools, churches, parks, art galleries, libraries, plant conservatories, and rail stations (this last likely to accommodate the trolley that then connected different parts of the city). Boarding houses were also legal here, if supervised by a corresponding institution (like a school). This zone was the slightly more flexible ancestor of today’s single-family zone. The second residence district permitted: any use permitted in the first district (likely why there are so many single-family houses on low-rise-zoned lots), plus any other type of multi-family housing including flats, apartment buildings, boarding and lodging houses, and hotels. The business district permitted what was allowed in first and second residence districts, plus stores, offices, banks, restaurants, theaters, laundries, garages, and other establishments (see the full 1923 ordinance if you’re curious for more). The remaining commercial, manufacturing, and industrial districts all permitted any of the prior districts’ uses—so, technically, these districts could host any type of residence, even if that wasn’t common. Overlaid across the city’s new use districts, Bartholomew’s ordinance established five height districts, the first blanket caps on height for reasons other than structural integrity: 40 feet (or 3 full stories), 65 feet, 80 feet, 100 feet, and “maximum height.” Most of the first, and much of the second, residence districts were capped at that lowest limit of 40 feet (again, today’s limit for single-family zones is 35 feet, and just 30 if built with a flat roof). Finally, Bartholomew’s 1923 plan also split Seattle into four area districts designated A through D to restrict lot coverage and setbacks. Most of the single-family-zoned land now fell within District A, which had a lot coverage maximum of just 35 percent (still in effect to this day), or 45 percent for corner lots—a stark decrease from pre-1923 standards of 73 to 100 percent. Despite all this, the 1923 district maps still permitted multi-family housing across a great deal of Seattle as compared with today’s zoning code. In particular, the plan committed significant portions of the Central District, Wallingford, and West Woodland, as well as bits of Magnolia and West Seattle, to multi-family housing via second residence districts. In all of these areas, one can still find multi-family homes that were built during this period. Since then, each of these neighborhoods have downzoned their multi-family areas, outlawing all housing types save single-family homes. I’ll explore Wallingford’s walk through its downzoning history in my next article. Over the subsequent decades of the twentieth century, apart from a stretch from about 1960–1980, Seattle would continue to grow in population, sometimes faster, sometimes more slowly. But its laws around homebuilding did the opposite, instead growing more restrictive with each new iteration of the city’s zoning ordinance. For instance, in 1947 the city further segregated residential uses by splitting the 1923 plan’s “second residence district” into two new classes: the “two family district” and “second residence district.” This new two-family district created a half-step between the city’s multi- and single-family areas, and with it a path for incrementally downzoning swaths of Seattle’s multi-family areas. Residents and city officials would take advantage of this incremental step in the coming decades, slowly downzoning pieces of multi-family zones to the duplex-triplex zone (as it came to be known). From there almost all of this land was gradually downzoned to single-family until the city did away with the duplex-triplex zone in 2011. Text from Seattle’s 1947 ordinance 75901, establishing a more restrictive “two-family district” alongside first and second residence districts. Public domain. Come 1957, a new plan would restrict vast additional tracts of multi-family land in Seattle to single-family and further stratify both single-family and multi-family dwellings. This is where today’s “SF5000,” “SF7200,” and “SF9600” originated: that is, the zone designations for a minimum lot area, in square feet, in single-family zones. In short, in under 35 years, Seattle went from supporting all kinds of housing across the entire city to fully 8 segregated residential categories, with multi-family housing options outlawed in over half of the city. Excerpt from Seattle’s 1957 Comprehensive Plan outlining fully eight different residential zones, three of them explicitly single-family. Public domain. Subsequent iterations of the Comprehensive Plan would continue to restrict the kinds of homes that could be built across Seattle—and hence, the kinds of people that could afford to live there. The 1990s would see a gerrymandering of low-rise development into a series of “urban villages” that concentrated multi-family housing options on a few small slivers of land peppered about the city. Interestingly, much of the land in urban villages today remains zoned single-family, and therefore not living up to the intention of the village strategy. As for vehicle parking, the 1923 zoning ordinance mentioned nothing of it, but the issue would creep into the city’s planning rules beginning in the 1970s and ‘80s. By the 1990s, parking paranoia would show up big-time in Seattle’s planning priorities. For example, the city’s 1995 code contained an eight-page list of parking requirements for fully 118 building types and businesses, ranging from sewage treatment plants to swimming pools, museums to mini-golf courses, plus another eight pages of text describing nuances in parking regulations. One year later in 1996, Seattle took one step forward for affordable housing options and made its first allowance for attached accessory dwelling units (ADUs, a.k.a. “backyard cottages” or “granny flats”). However, it also required each new mini-home to have its own off-street parking space in addition to the one for the main house, making ADUs effectively impossible to build on many single-family parcels across the city. Combined with more downzones, increased setbacks, and reduced height limits, parking requirements helped to eliminate many of the more affordable multi-family housing options in the city. They also added to the cost of what housing could be built, increasing rent across the city. As for vehicle parking, the 1923 zoning ordinance mentioned nothing of it, but the issue would creep into the city’s planning rules beginning in the 1970s and ‘80s. By the 1990s, parking paranoia would show up big-time in Seattle’s planning priorities. For example, the city’s 1995 code contained an eight-page list of parking requirements for 118 building types and businesses, ranging from sewage treatment plants to swimming pools, museums to mini-golf courses, plus another eight pages of text describing nuances in parking regulations. This is a counter-intuitive history: a growing city with increasingly strangled housing options. Today over half of Seattle is reserved exclusively for single-family, detached homes (plus ADUs, though policy barriers to those are so high that their addition to the city’s housing scene has been glacial). Today’s zoning code restrictions on housing development are a far cry from the city’s flexible approach to housing in the early 20th century. Growing population coupled with squelched housing choices is not a recipe that works, though it’s one that has played out not just in Seattle, but across the region, though it’s one that has played out not just in Seattle, but across the region. AndAs a result, the city, and increasingly larger swaths of all of Cascadia,, and increasingly larger swaths of all of Cascadia, now has the housing prices to prove it. It’s no surprise that today’s conversations about Seattle’s future are so heated. Many don’t understand or don’t want to take responsibility for addressing the above history as to how the city got to where it is today. Others—especially communities of color, immigrants, and families with lower incomes—know it all too well, whether in current patterns of gentrification or in historic exclusion from homeownership and resulting wealth-building in so-called “desirable” neighborhoods. The fact is that Seattle’s housing crisis is self-inflicted, and indeed was crafted by a minority of mostly white, male planners, profiteers, and politicians. It directly results from land (ab)use patterns and their embedded racism and classism, but ignorance and denial of this are making slow, painful going of rectifying these wrongs. For example, the HALA recommendations, a rich suite of tools to help build the homes we desperately need, were besmirched in the city’s biggest newspaper before they even saw the light of day, stoking a fire under those who would prefer to forget that they live in a city, a place meant to change and grow, and in so doing offer to more people the opportunities it represents. In short, the Bartholomew plan is alive and well in Seattle in 2018. It has more pages, new language, new faces and names involved, but it is still indisputably accomplishing the exclusion and proscriptions desired by a small, disproportionately influential group of residents—and it is holding Seattle back from the city it could be. It’s time to bury Bartholomew and his backwards planning priorities. It’s time to answer the housing needs of our growing twenty-first-century city with an honest reckoning of the past and an ambitious, inclusive vision for the future. And it’s time to build into the very wood, bricks, steel, cement, and design of Seattle the diversity and equity to which Cascadia aspires. In part two, I’ll explore this history in one specific Seattle neighborhood: Wallingford and examine where things are headed in that neighborhood today. This article was adapted for Sightline Institute by Serena Larkin and Sightline senior research associate Margaret Morales from three original articles by Seattle dad, designer, and writer Mike Eliason. Find his originals here, here, and here, and find Mike on Twitter at @bruteforceblog. Maybe not everyone in Cascadia wants to, or should, live in a Bladerunner/tenement world. Instead of pathologizing a basic need for space, why not champion lowering the birthrate or push tech behemoths to house their imported workers in company apartment blocks on transit lines. Why the compulsion to punish people for wanting to live in the houses they worked & paid for? In what way do you feel punished? This is actually a problem with “the missing middle” that is, buildings in between massive high-rises and single family homes. This would fill a niche that is more space efficient than single family homes, but it would be human-scale, unlike large towers. Thank you for posting Mike’s great work! Nice write-up Mike! Maybe a third article could weave together the history of redlining, racially restrictive covenants, and racism in renting & selling apartments/houses? This could be an entire book. I wish we also had more personal stories about the people behind these actions, like that of Harland Bartholomew. Even though I am lucky enough to live in a single family home that I have paid for, I do not feel that this article is intended to punish me, but rather to reflect on the benefit I have received by being born white and relatively smart. Obviously, due to the growth in population here, we have to go back to a more flexible zoning system. Even though the birthrate in the US is lower than it has ever been, the expansion of job growth NOW means more need for housing, demonstrated by the working poor who are camping on any land they can find. This article is so filled with errors of fact and interpretation, it is difficult to know where to begin. First, the author implies that Harlan Bartholomew was somehow responsible for Seattle’s zoning ordinance. This is false. Harlan Bartholomew did visit Seattle on February 22, 1921, to consult with the city’s new Zoning Commission, but Harlan Bartholomew never worked for Seattle and was never a paid consultant to Seattle. Second, the author selectively points to zoning ordinances in Southern U.S. cities, but would do better to consider zoning ordinances adopted in almost all U.S. cities in the years from 1919 to 1929. Third, consulting the historical record of discussions of zoning in Seattle from 1920-23 indicates that much of the focus was on issues of the possible spread of industrial uses (like meat-packing plants) and institutional uses (like hospitals). Fourth, the writer implies that issues of race and class underlay the decisions made in the years 1920-23 when the city’s first zoning ordinance. There is no support for this claim in the historical record. In fact, at the time, zoning was seen as a benefit to poorer neighborhoods since it would protect them from intrusive uses. It was understood that rich neighborhoods could protect themselves with private covenants (deed restrictions–what today are called CCRs) but poor neighborhoods were unlikely to be able to do this. Fifth, the writer selectively omits any discussion of the implementation by the private sector of racial restrictions through private covenants–these were carried out by bankers, mortgage lenders, and developers, but were never part of the action of actions by the public sector. What nonsense. Many facts reinterpreted to suit a perspective. Let’s start with the premise, that single family zoning caused the imbalance between jobs and housing that we now see. Up until 1975, the city’s stock of single family housing was extraordinarily cheap compared to wages. One could buy a single family home on a double lot in Wallingford for $25,000. Now, that property could easily be worth a million dollars. What changed? It wasn’t the zoning. What changed was the city and the region began a process of limiting the city’s expansion without regard to the economic consequences. Sprawl was an evil thing that would be stopped and so it was. And that begat urban villages and that begat south lake union and rampant and unfettered growth by people seeking to take advantage of a tax system that was completely biased against the poor and for the wealthy. You want to indict the bungalows but you bungled the analysis. You now look at the SFD and say Evil!, but the developers and the money men have now gotten rich on the hyper inflation caused by the imbalance. Everybody who owned land and property has gotten rich. And how deeply cynical to look at racism in this context. The Central Area was long zoned for single family. But you have it backwards! It was rezoned UP in the 1970s to duplex because African Americans had no power. The other districts kept their SF zoning and the Black community was treated to an upzone that did a disservice to that neighborhood. If you want to understand urban economics, understand that imbalances cause inflation. The zoning situation was known in 1975. What planners failed to understand was the effect of limiting supply on the cost of land, the fact that new housing was always going to be more costly than old housing and, most importantly, that the high cost of new housing, both rental and for sale, would actually pull up the value of existing housing, creating an upward spiral that we witness today. You nailed it. We have never had adequate zoning for affordable housing, and so the price of land has skyrocketed, enriching landowners and exacerbating the housing crisis. Before the 1923 zoning ordinance, multifamily was legal *everywhere* in Seattle. What is true is that the planner who consulted on the zoning code knew the effect zoning had on low income residents – and single family zoning was used to prevent encroachment on wealthy neighborhoods from those who weren’t wealthy. And the history of zoning in this city since it was enacted has been about focusing all new housing where multifamily housing already exists. This is why the urban village strategy is a strategy that exacerbates displacement. That it was a process largely coopted by homeowners opposed to housing – all the more so. You seem to be blaming it on planners – but it’s not planners that set policy. In the late ’70s, planners told the city that preserving single family zoning would cause housing to increase. The mayor and council ignored the planners advice, prevented low- and middle-class housing options from nearly 90% of the city – and we’re seeing the ultimate effects of that today. The root of the problem is not solely, but largely, because affordable housing is illegal in almost all of the city. We need to change that. Almost every city in America has zoning like Seattle’s, yet only a few are unaffordable. This article says nothing about King County’s urban-growth boundary or Washington’s 1992 Growth Management Act. Those are the real causes of high housing prices, not ordinary zoning. If rural King County had been available for new development, housing in the city of Seattle would never have gotten expensive. The King County Urban Growth Boundary is nearly three times larger than the city of Vienna, which has roughly the same population. Vienna is also nearly 50% parks/open space, and has no single family zoning. The issue isn’t the UGB, it’s that we’ve relabeled sprawl as being urban. Most of the UGB doesn’t allow multifamily housing. Until 1956, the lowest level of King County’s zoning code allowed duplexes outright everywhere. This is really the crux of the issue. Some of the article makes sense in explaining the issue but like many such articles there is not much in the way of solutions. Once rules and regulations are in place it is almost impossible to reverse course. There has always been a battle between single family and multi-family and little of it has to do with race. Those who have studied what happened in the CD (rapid transition from mostly Black in 1980 to mostly non-Black in 2010) do not focus on zoning. Quintard Taylor and Henry McGee are two such authors; they talk about gentrification and economic displacement, not zoning. Increasing building capacity through zoning does nothing to produce affordable housing. Affordable housing is produced through a more equitable political-economy and adequate publicly owned or subsidized housing to fill the gap. We have neither. It is true that the MHA program will generate funds to support filling the gap. However, articles like this (and many others published by Sightline and other density advocates) do not focus on that aspect of the “grand bargain” and whether it is likely to accomplish its purported objectives. In fact, Seattle’s MHA proposal is not inclusionary zoning, and its fees and requirements are about the lowest and weakest of any similar proposal—proposed or adopted—anywhere in the country. Therefore, it will not provide much affordable housing for low income families—and almost certainly not in the same neighborhoods, it will not prevent continued economic displacement, and it will probably make economic and racial segregation in Seattle worse. Instead of engaging in a discussion about the problems with the MHA as proposed, a polarizing narrative of blame (scapegoating) is used. For a more complete and nuanced perspective on this debate, please see Yimbyism and the cruel irony of metropolitan history. Also, Eliason and other density advocates like to cite Seattle “down zoning” since the 1923 code (which was expressly designed to accommodate a million people). What I notice is regularly omitted from references to the 1923 code (there was no “comp plan” in 1923) is the height map. E.g., the 1923 version of the zoning code for the CD includes this height map for the same area. Much of the area east of 15th is in the lowest height category, “Area District “A”.” A complete narrative of Seattle zoning history would include reference to this provision in the 1923 code. 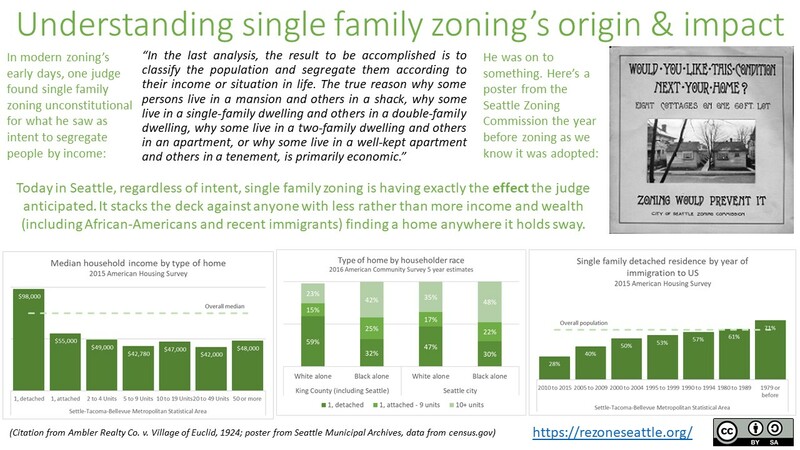 Kate Davis’s thesis (Housing Segregation in Seattle: An Update of A Study and Data on Segregated Housing in Seattle Seattle Human Rights Department, 1976) which I referenced above, does go into zoning. When Rothstein was in town to discuss his book, Taylor stated that even he didn’t know the federal government was responsible for segregation. Yes, it wasn’t just zoning, there were other means as well. How can it be that ‘increased capacity does nothing to produce affordable housing’, when followed by, ‘it is true MHA will generate funds to produce [affordable housing]’? This is the very reason why MHA is needed – the status quo will never provide enough affordable housing. More importantly, doing nothing has seen the value of home values skyrocket while single family zoning loses population – further exacerbating gentrification. Speaking of adequate publicly-owned or subsidized housing in the neighborhoods – we’ve had ample opportunities on this that have been stymied by homeowners. This isn’t scapegoating, it’s confronting the past so that we can learn from it. In the late ’70s, Royer’s OPP proposed a policy that would have allowed low-income missing middle housing in every Seattle neighborhood. The community council and homeowners showed up big time to have this killed, in the midst of a housing crisis. This was after homeowners got the council to continually downzone Seattle’s multifamily housing to single family for decades. Homeowners then voted down rent control. They pushed for increased regulations on multifamily housing that drove up the cost of development. Homeowners also had an opportunity to get affordable housing requirements in the urban village comp plan as well – neighborhood activists ultimately pushed to get that removed. In lieu fees are part of many IZ programs – and high IZ requirements have cratered development in nearly all locations. The only way to get abundant social housing is to pay for it through taxes. Given that Bartholomew is on the record of using zoning to explicitly slow or stop the movement of people of color into white neighborhoods, I don’t see that height and area maps as being inconsistent with that at all. The lower heights and reduced lot area would have worked in conjunction to significantly restrict the types of housing that could be built here – same with single family zoning today. In effect, it was a buffer to the neighborhoods along the water with views. The 40′ limit is also in keeping w/ the 1919 building code. I should have written “Increasing building capacity through zoning *by itself* does nothing to produce affordable housing.” I don’t argue that a real IZ program would help produce some affordable housing. Regardless, your response dwells on the 1970s. I’m focused on what is happening now. You don’t respond to my basic point about Seattle’s MHA; it is *not* an “inclusionary zoning” (IZ) proposal. You confuse the need for real IZ with your obvious desire to increase density for other reasons. When Rothstein was in town to discuss his book, he sat on a panel hosted by the federal practice bar association along with Quintard Taylor and Rory O’Sullivan. It was observed (by O’Sullivan) that Murray’s HALA MHA is *not* inclusionary zoning. The others did not disagree. Do you deny this assessment? Your conclusion, “The only way to get abundant social housing is to pay for it through taxes.” is only partially true. IZ is not strictly speaking a “tax,” but it also produces social housing. The real issue is who gets to “pay” for social housing. In Seattle, the answer appears to be everyone but those who cause gentrification and economic displacement in the first place, such as Amazon and real estate investors. Yes, I would disagree. There is no singular definition of inclusionary zoning – it can be mandatory or voluntary, it can be fees or units, it can have bonuses or extractions – but the underlying premise is that affordable housing is linked to the production of market-rate housing. MHA’s affordable units are the direct result from the production of market rate housing, ergo MHA is a ‘real form’ of inclusionary zoning. It just happens to be a form that isn’t liked by those who [incorrectly] believe exclusionary zoning is benign. Who should pay for social housing? Everyone should. You. Me. Employers, including amazon et al. But yes, also homeowners – who earned a collective $6 billion dollars in home value in a single month via massive swath of the city facing a moratorium on affordable housing. By definition inclusionary means “a part of” as in a part of the community where people are displaced by gentrification and by the redevelopment of existing naturally affordable housing. Can you name a single “inclusionary” housing program anywhere using that word without mandating inclusion? Even Ed Murray had the grace to drop the word inclusionary within a few weeks of rolling out what became known as MHA—the same day as he announced the grand bargain. Your pivot to impliedly blaming homeowners (supporters of “exclusionary zoning”) for not paying enough for social housing is based on your apparent refusal to differentiate between place and exchange value. People do not realize the increase in home value until they sell. I.e., move somewhere else. Maybe we should impose a hefty local tax on the capital gain to make sure those homeowners pay their fair share. Maybe we could even try to impose the tax before the gain is realized. This would be similar to the fiscal mechanism Rob Johnson suggested during his campaign to make land tenure turn over faster for redevelopment. How does MHA increase affordable housing housing along with economic and racial diversity *in the same community*? Land tenure is a crucial element of fair housing—racial and economic justice—and the MHA program doesn’t address it. There is no singular or standard definition of inclusionary zoning – most IZ programs don’t even require that inclusionary units be built *on site*. Again – it was *homeowners* that killed actual affordable housing in single family zones in the 70s. And then killed affordable housing requirements in urban villages in the 90s. Was that because of *use* value? No, it was because of *exchange* value. Now a vocal minority (consisting largely of homeowners) are using the legal process (yet again) to stop the nominal upzones for affordable housing under MHA. Just as homeowners are using legal process to stop affordable housing at Ft. Lawton. So yes, there is plenty of blame to go around – but homeowners are far from blameless – in fact most of our problems are derived from polices that prioritize homeowners and single family zoning instead of renters/multifamily zoning. This was the entire point of looking at the history of zoning in the city and this series of articles. I wish you had read it. I’m waiting to see some work showing that “most IZ programs” don’t require housing in specific geographic areas (I never said “in the building”). Homeowners “killed actual affordable housing” in the 1970s? That’s news to me and other families I know who bought then with relatively small down payments and affordable mortgages. And in the 1990s too?! Anyway, how is buying and living in a house indicative of exchange value? Does your narrative mean the 2010s $100K plus tech workers buying houses now are “killing affordable housing in the SF zone?” Your logic here is hard for me to follow. Injecting the most obnoxious NIMBY behavior you can think of into the dialogue is a broad brush generalization, and is pure guilt by (non)association. Concluding with “most of our problems are derived from polices that prioritize homeowners and single family zoning instead of renters/multifamily zoning” is an extreme leap of illogic and wholly ignores huge areas of political and economic reality in Seattle and the world. Remember that promoting “ownership” as opposed to a 100% focus on rental housing is a major aspect of fair housing and related social justice work. BTW, I have read your recent articles (and many others); I just don’t agree with your perspective. You make a few legitimate points (i.e., logical and factually supported), but IMO you are like the blind one holding onto the trunk of an elephant and thinking that is the character of the entire beast. If you want to read something (not too long) that explains some other causes of “our problems” you could start here; chapter 4 has a narrative of what happened to set up South Lake Union to become Amazonia, unleashing years of extremely rapid growth and thus gentrification and other largely unmitigated externalities. I do not claim this narrative describes the *only* cause of “our problems,” but the story is clearly a major part of the relevant political-economy around here. Seattle’s biggest regulatory barrier to that outcome is single-family zoning. Nope: the biggest single barrier is the skyrocketing cost of all housing (and of the land needed to build social housing). “regulatory” is an irrelevant criteria. Social housing is extremely rare in single-family zones because it’s almost always multifamily. Single-family zoning is a huge restriction on the availability of land for social housing. All housing that addresses “economic and racial diversity” is not rental housing (“social housing”). Conservation and encouragement of ownership options is a key component of a fair and equitable solution to housing issues. To quote myself just above, “promoting “ownership” as opposed to a 100% focus on rental housing is a major aspect of fair housing and related social justice work.” This consideration is explicit in how the Fair Housing Act is implemented; failure to address housing tenure is a major flaw in Seattle’s MHA proposal. As detailed in Seattle’s new draft EIS on ADU reform, the 1/5 of Seattle’s single-family homes that are rentals have relatively high rents—only a small fraction of them are affordable to low-income people. The best way Seattle could support ownership is to allow less expensive options by not limiting so much of the city’s land to single houses on 5,000 square feet of land. The housing market simply doesn’t work that way in a rapidly growing area. There is no way to significantly increase affordable housing by means of market solutions in such circumstances. The best that can be done is preserve as much existing affordable housing—both rental *and* owned—as possible, while also increasing the supply of social housing as much as possible. I think we agree on the latter mechanism in broad brush, but disagree about how best to do it. I will not agree to your market solution bias until you produce data showing it to work more than at the margins with tools like IZ. Other “anti-market” tools like rent control would help. How do you preserve existing affordable housing? Keeping all our single-family zoning in place certainly hasn’t worked. Come on Dan, you’re the one working in a think tank; you know there’s a range of solutions that includes non-market based actions. The HALA report itself contains a series of proposals to “Promote Sustainable Homeownership” for at-risk households. Toby, this is basic math: in an expanding economy the more you limit density the higher the cost of housing and land. If Seattle de-zoned we’d at least see a plateauing of prices with a variety of buildings cropping up to satisfy high-end demands, followed by middle and lower demands. In our current expanding economy we have high competition for a scarce product, namely small homes. So this downstream hunting leads to ratcheting prices for old rentals and small homes. In a de-zoned scenario we could have an expanded variety of ownership and rental options, with the cascade of demands being eventually met. If you don’t understand the mechanics, take a look at the 10 year history of the smartphone market and see what’s happened to the prices for a product in demand. Roman, this is not “basic math.” Housing is not smart phones (widgets). You’re talking about “filtering” (AKA “trickle down housing”). Filtering does not work in fast growth areas because the “naturally affordable” housing (i.e., older housing) gets torn down before it can become affordable. Even buildings from the 60s Worlds Fair boom, and through the 80s post Boeing downturn boom, are being torn down where the zoning allows for larger buildings and the market encourages newer higher rent/costlier buildings. Moreover, even the “naturally affordable housing” becomes less affordable because the rental market is going nuts under the rapid growth pressures.